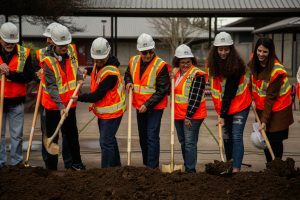 The bond project for South Albany High School will include the development of a new multi-purpose/auxiliary gym, theater upgrades, and the renovation for two new CTE classrooms. The theater upgrades will support the construction of a lobby, concessions, elevator addition, and a restroom expansion. The groundbreaking on South’s new multi-purpose/auxiliary gym happened December 26th of last year. 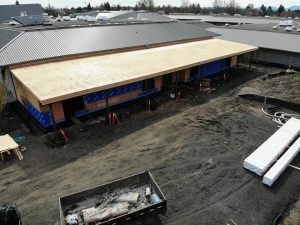 In January, a temporary shelter was made so the gym could continue to be used during construction and a foundation was prepared for the two new classrooms. 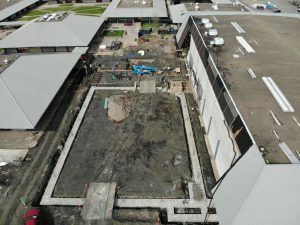 Once underground utilities are resolved around the auxiliary gym, the building pad will be completed and under slab utilities will be installed. Construction of the auxiliary gym in February. Building 10 Auxiliary Gym, April. 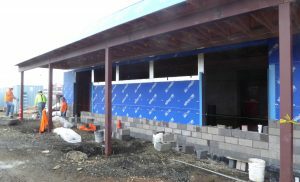 March saw a tremendous turn of events for construction at South Albany High School. Discovery of new underground utilities finally ended, and D&I Excavation did a great job of buttoning up the pad so footings could be started for the Building 10 Auxiliary Gym, including the new elevator pit. 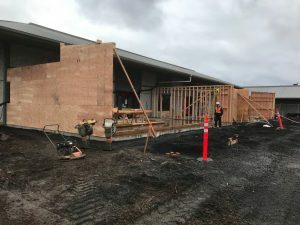 In addition, the mezzanine in the Building 4 CTE space was removed, and the two new classrooms to the north of Building 4 completed rough framing and roof structure for a dried in space. This included steel columns for the exterior support. Underground hydronic piping was installed between the Building 5 Central Plant and existing Building 10 Gym, and the existing lobby and restrooms saw continued demolition in preparation for upcoming remodeling work. 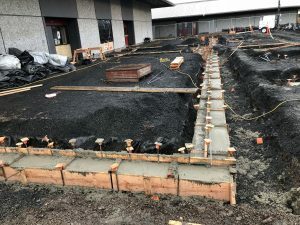 Spring Break saw substantial milestones including the cutting over of power serving Buildings 8 and 9 into support the new Building 10 Auxiliary Gym footings. HMKCO also hosted the Pre-Planning Meeting for Commissioning with Northwest Engineering Services Inc (NWESI). This triggered the District hosting a separate series of coordination meetings with Long Building Technologies who is involved in both the South Albany High School construction project, and district efforts to refine direct digital controls for the school central plant (HVAC system) outside the construction project. Click HERE for initial design drawings. Click HERE for photo-realistic design renderings.